When a recipe calls for a touch of sweetness, pure maple syrup is a healthier choice, as it contains significant levels of essential vitamins and minerals – manganese, riboflavin, zinc, and even some potassium. 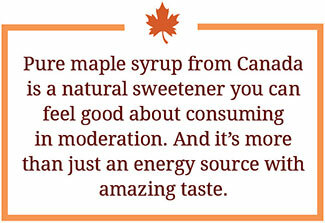 Maple syrup and products are a great addition to the active lifestyle, adding flavour and nutrition to meals and snacks. Regular exercise is an important part of a fit lifestyle, and goes hand in hand with healthy eating. Here are a few ideas for fueling your workouts. What you eat before you work out must digest quickly, give you energy and not leave you hungry.The meal or snack you choose depends on how much time you have before you work out.Digesting protein, fat and fiber takes a long time, so it is better to limit your intake before you exercise.But be sure to add these essential nutrients into other meals. These recipes ideas are for a pre-workout snack, ideally eaten 45–60 minutes before your workout.They supply both simple and complex carbohydrates for energy, a little protein, very little fiber and zero fat. If you exercise for more than 60 minutes at a stretch, it can be important to replenish your muscles with carbohydrates to keep your energy level up and avoid dehydration, especially if your last meal was more than two hours before you started, or your workout is very intense. Here are some recipes for energy drinks made with maple syrup that provide your muscles with readily usable sugars and electrolytes (sodium and potassium) to replace what you have lost via perspiration. These energy drinks may be made at home have no added colouring, artificial flavours, additives or preservatives. Natural energy from Canadian maples! After your workout, it is important to begin the recovery process. The ideal way to do this is to eat foods that will give you at least 30 to 60 grams of carbohydrates and about 10 to 20 grams of protein. If you will be training or exercising for more than 90 minutes, combine your energy drink with a snack to meet your energy needs (about 30 to 60 grams of carbohydrates per hour). 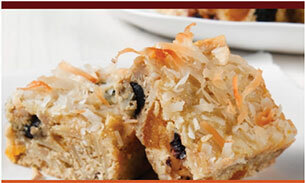 Try these delicious, easy-to-pack energy bars to give your body the carbs and nutrients it needs. These recipes make excellent snacks, whether in the afternoon in preparation for an end-of-day workout, after you’ve finished your workout, or to pack for a long hike or bike ride. They provide complex carbohydrates, protein, fibre, vitamins and minerals—all vital nutrients for an active lifestyle! Maple water (NAPSI Certified) is a great source of hydration during exercise and workouts, providing electrolytes and minerals, while being naturally low in sugar.